I see a lot of wildlife art based around the “Big Five” or other large animals that the public identifies with. 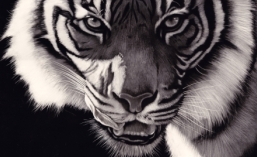 Tigers, lions, leopards and elephants are staples of many artists, and I have drawn or painted them many times too. But I believe it’s a mistake to rely on these. The natural world is jam packed with wonderful fauna (and flora) ranging from massive to miniscule. My dad worte a book about East African reptiles and amphibians and if he had lived longer, he was going to write a second book called “Not only Elephants”. He was of the same opinion as me and this book was going to be dedicated to the animals that people often missed like shrews, zorillas, tortoises, rock hyrax and so many others. Tourists used to come to East Africa in search of the big five (elephant, black rhino, leopard, lion and buffalo – grouped together because they were the most dangerous animals to hunt) and in their fascination of these large animals, they often missed so much beauty that flashed by them as they motored along in their zebra striped wildlife viewing vehicles (painted in stripes more for the appeal to the tourists than the camouflage they afforded the vehicle). I was in a similar vehicle recently, and some of my fellow occupants would be staring into the distance for a sighting of an elephant or leopard whilst missing lilac breasted rollers and malachite kingfishers. They would look at me as if I was mad as I turned over stones looking for lizards, scorpions and snakes. Ok, maybe I am mad but look at the smaller creatures in our world and I defy anyone to prove to me that the larger creatures are more wonderful. Thus, I also believe it’s our duty as wildlife artists to research and educate people about these animals. I’ve recently been challenged to move towards the less fashionable animals so here are a couple of new pieces. Meerkats are quite popular nowadays, in part due to that amazing TV series “Meerkat Manor”. 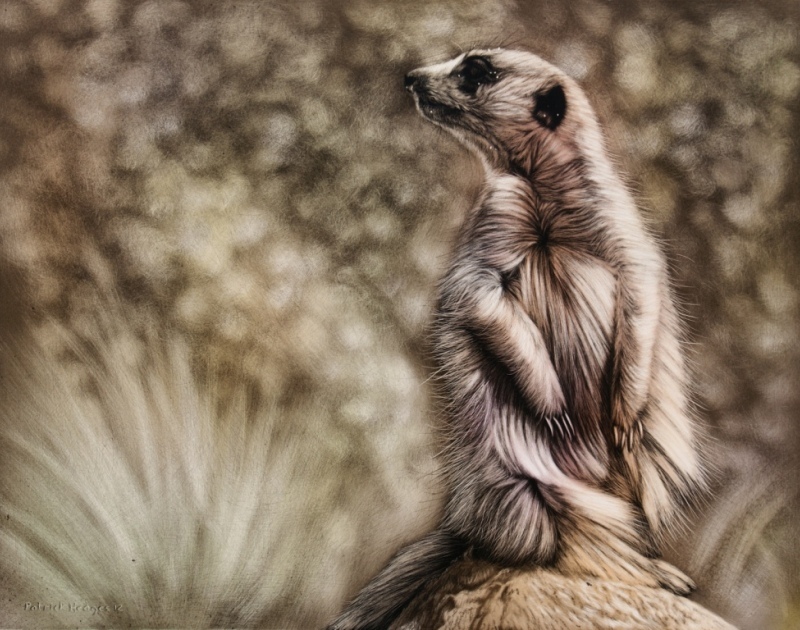 Here’s my take on a meerkat looking out for predators. I’ve included specks of dirt on the meerkat’s head to show that, whilst they are always alert for danger, they are constantly digging for food and shelter. And an even less fashionable animal, an iconic Australian species. 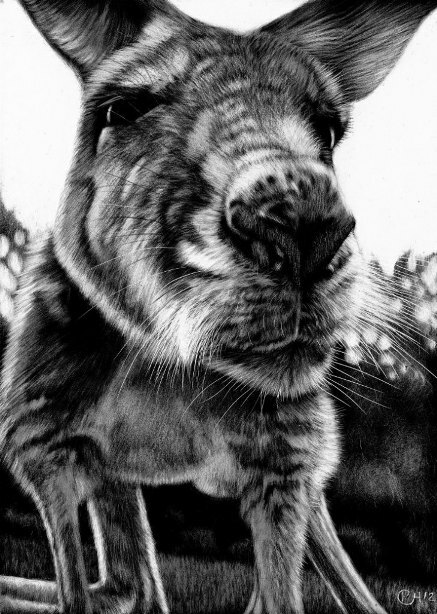 The grey kangaroo isn’t depicted too often in art simply because they look so cute and therefore artists shy away from them. I do too but I managed to coax one to come right up to my face and I caught this distorted “pleased to meet you” kind of look. Totally agree. There are so many creature overlooked by the public while they crane to see the Big 5.